Football season is finally here! With just a day away from kick off, I personally am going to find myself something to wear for tomorrow. A little last-minute but I know Scarlet has me covered. 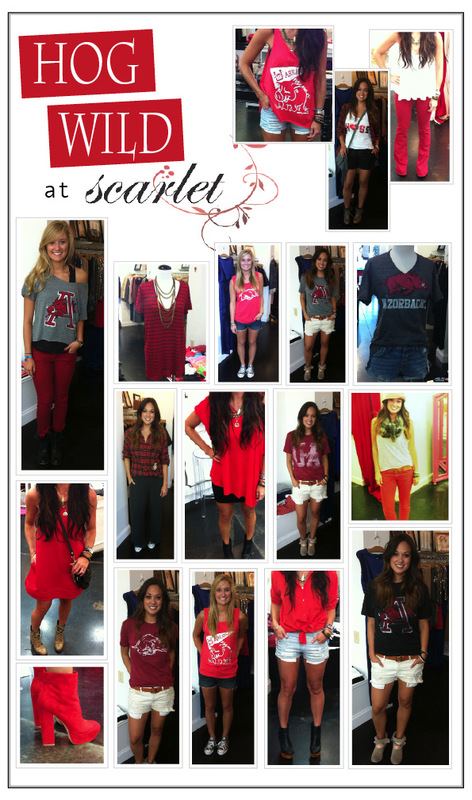 Scarlet is a women’s boutique located in Pleasant Ridge Town Center, next to Panera Bread and Fresh Market. They have a wide range of Razorback gear, from casual to dressy. Tanks start at $40 and nothing is over $100. They also have great gifts for new pledges! Go on…. go to Scarlet…. This entry was posted in Fashion and tagged football, hogs, scarlet. Bookmark the permalink. I love it all, especially the red pants.